Not sure what to pack for South America? I’ve got you covered. While I ended up staying in South America for five months, I packed with three months in mind. *Disclosure: If you decide to make a purchase after clicking any affiliate links included below, I may earn a commission (at no extra cost to you). Before we begin, let’s start with this major premise: South America is a large continent consisting of a diverse array of climates, from the hot and humid Amazon jungle to to the arid and cold Andean mountains, so obviously this really depends on where you plan on going exactly. Also, I lived in South America (mostly Peru) for those five months; it wasn’t like I was constantly on the move, so of course I ended up buying things to settle in to my apartment, such as dishes, towels, and a space heater. Unlike more trendy destinations, Western Europe for example, trips to South America tend to involve more rugged and outdoor activities, so the items you pack will likely reflect that. My original plan was to go to Cusco, Peru and then Buenos Aires, Argentina–two very different climates. To deal with this disparity, I packed clothes that I knew I could layer. Cusco, at 11,000 feet in the Andean region, is much dryer and colder than Buenos Aires, which is at 80 feet and borders a large river. Additionally, I knew I would be trekking the ancient Inca site of Machu Picchu one week, and then strolling the fashionable metropolis of Buenos Aires the next. Quite the packing conundrum. So what did I end up bringing? 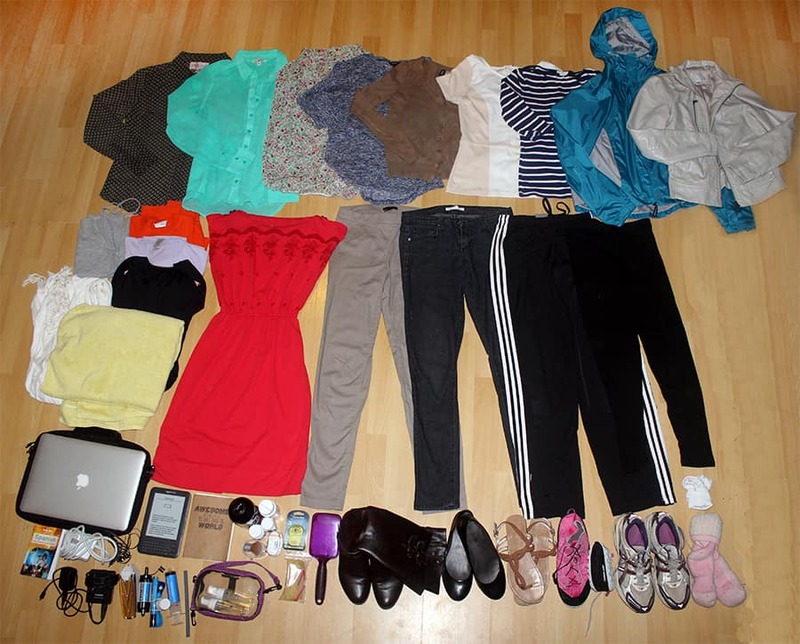 Here’s my list of what I packed for Cusco, Peru. I’ve included some affiliate links, and tried to link to the exact product models I purchased, when possible. Ginger candy (If you’re like me and get motion sickness in cars and buses, I highly recommend these for Cusco’s winding mountain roads!) I also love these ginger chews. These items that are pictured above I ended up not bringing: 1 towel, 1 hairbrush, 1 pair of running shoes. These things pictured above are what I wore on the plane: shirt, tank top, jacket, pair of jeans, pair of boots, leggings, wool socks, and a scarf. It’s important to note that I was not exactly a fashionista during this time; backpacking through South America made me care only about functionality, not style. This made packing much easier. These are great because they’re versatile and can be layered for warmth. For the times you’re in rainy weather. One thing is true across the board for most of South America: You’ll be walking a lot. 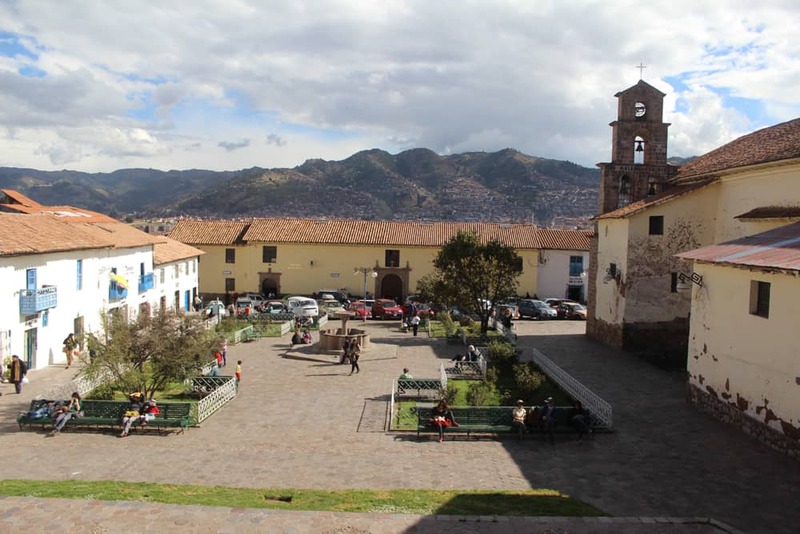 This is a MUST for the Cusco region, where high altitude means some intense UV rays. Yes, you will find that you often can buy anything you need in the place you’re traveling to, but, as a female, I can tell you the hardest things to find will be toiletries you’re accustomed to using, such as tampons or makeup, for example. One pair can be for walking around town. Don’t forget water-resistant flip-flops for showering! Especially if you’ll be staying in hostels, you’ll find the world to be a noisy place. No. Unless you plan on camping every night, you do not need a sleeping bag. Occasional campers can rent gear once they get there. Unless you are going to wear them on the plane and then use them on a weekly basis while in South America, I say leave the hiking boots at home. They are way too bulky and you can always rent a pair if you go on a major trek. How many pairs of clothes should I pack? Fewer than you think you need. My weekly wardrobe consisted of the same 2 pairs of paints (1 khaki and 1 jeans) and about 5 shirts I rotated. This, of course, will mean you have to do laundry every week (super cheap usually) and you won’t be a fashionista. Anyway, you can always buy more clothes if needed. Should I bring my DSLR? This is tough. DSLRs take up precious space in your bag and are heavy. Basically, if you are a professional blogger or photographer, then yes, bring that professional camera because you need high-quality photos. If you’re not either of those things, then a point-and-shoot–or maybe even your smartphone–will be sufficient for capturing memories. This is essential because you’ll be traveling across different climates. Don’t worry about getting everything you think you need into your luggage–you can buy things when you get there. As you can see, I did NOT pack well for an Andean winter, so I had to buy a down feather jacket while in Cusco. This worked out perfectly for two reasons: 1) A puffy jacket would’ve taken up WAY too much room in my bag and 2) Buying a North Face jacket (even if it was a knock-off) was much cheaper in Cusco than in the United States. This saves room in your bag! Plus, I tend to freeze anyway on flights, so this works out perfectly for me. Yes, this does enable you to pack more. Packing cubes enable you to pack more, by compressing items and keeping them organized so they don’t slide around in your bag. What are your best packing tips? Comment below! *Disclosure: This post contains affiliate links, which means if you buy a product through one of the links I provide, then I will receive a commission–at no extra cost to you. I included links either to the exact products I personally used or products that are similar. Thank you! 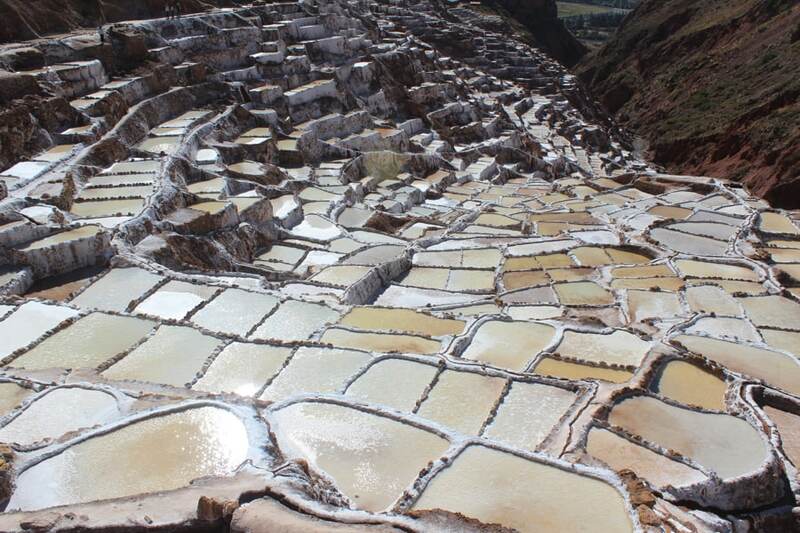 If you’re going to Peru or Bolivia, you may encounter high altitudes and altitude sickness. 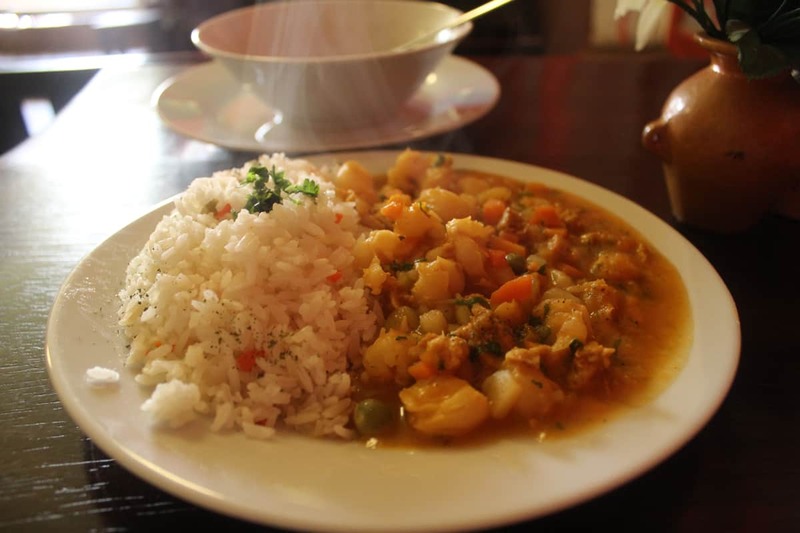 Be sure to check out the 10 ways I avoided altitude sickness in Cusco and Machu Picchu. Really good post and helpful as i am planning a 3 months trip to South America. Would you recommend a 65 litres backpack + day pack or i should be ok with a medium suitcase with wheels and a 30L day pack? Well, in my opinion, 65L will be way too much to carry around South America for 3 months. I had 40L and it was more than enough at times. When it comes to packing, buy the smallest possible bag and then find a way to fit what you need in it. If you buy a big bag (like 65L) you will find a way to stuff it to the brim as well. Everything expands according to the size of the bag you choose. You should be totally fine with the suitcase and 30L backpack! Follow the tips in my blog post, and just remember, anything you end up needing you will probably be able to find on the road. It’s best to keep it light so you’re not regretting packing too much when you’re on the 10th hour of your journey and your back is aching. Hope this helps! If you have any other questions, please ask. I have just returned from South America. In Patagonia it got below zero. Definitely needed puffer jackets, scarf beanie and the thermals. Only took sandals and hiking shoes, that was all I needed even at good restaurants. Recommend 2 scarfs one to dress up a basic outfit and one for warmth. What about the return trip if you shop. I checked posting items back but the cost was horrific so I took a luggage sufficient to cope with this.